Valentine´s Day ist he day of lovers – and there is no better place for lovers to go than PARIS! With a little bit of luck you and your partner are flying to Paris and will b espending a romantic weekend (the trip is worth 1.000 Euros). Lottoland Limited will hold a raffle draw on Saturday, February 14 (promotion 14.02.2015 starts at 00:01 and ends at 23:59). If you purchase one or more lines on our website, you will automatically qualify for the raffle draw. If you have purchased one or more lines on our website within the stated promotion period, the order ID of your ticket functions as your lucky number! If your lucky number (the order ID of your purchase) is drawn, we will contact you about your prize. To get in touch with you, we will use the E-Mail address that you registered with (customer account). In case your participation in our raffle draw is not possible due to factual or legal circumstances, then you as a winner will no longer be entitled to redeem the prize. If you have not redeemed your prize within 8 weeks (starting after the raffle), you will no longer be entitled to the prize. There will be no other winners of the prize if it is unclaimed. Voucher / prize non-transferable. 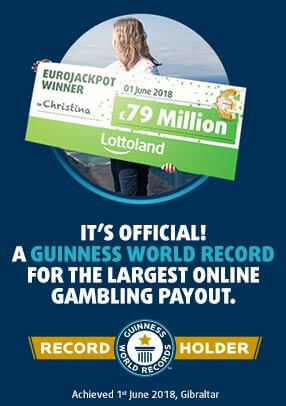 We would love to present the lucky winner to all of our Lottoland customers. So we want to make you aware that by participating in this raffle draw you agree to let us show your city of residence, your first name and the first letter of your last name – of course only if you have won! Lottoland reserves the right to publish pictures and texts connected to this raffle. Lottoland staff and family members (as well as staff and family members of companies that are involved in this raffle draw) are excluded from the raffle draw. Exclusion of participation: Any player found to have manipulated the draw (websites) or the system, or publishes offensive material will lose their entry in the raffle draw. Lottoland Limited reserves the right to disqualify a player from the raffle draw. Liability: The Promoter shall have no liability for any system failure or other action or event that prevents a player from entering the promotion. Promotor: Lottoland Limited, Office Suite C, Ocean Village Promenade, Gibraltar (EU), retains all rights to the raffle draw and the raffle process. The winner will be announced on 16.02.2015 under the supervision of an independent external adjudicator. There is no right of appeal and no legal recourse is permitted. => In case you have any questions, please contact customer care.